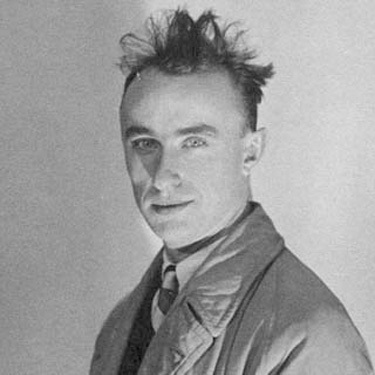 Yves Tanguy was a creator of mysterious mindscapes, oneiric subaqueous realms filled with amorphous objects that teetered on the biological. These pictures placed him at the forefront of Surrealism; early in the history of that movement, his work was championed by its founder, André Breton, and the soft, desert-like, lunar or marine universes that he created came to influence a huge number of his fellow artists. Tanguy was born in Paris to parents from Brittany. He was raised in part in Brittany, growing up among the menhirs and cliffs and with a strong sense of the presence of the sea on which his own father had served in the Navy. He also attended the prestigious Lycée Montaigne in Paris, where one of his contemporaries and friends was Pierre Matisse, the son of Henri, who would later become one of his art dealers. Pierre also appears to have introduced Tanguy both to his father, and to art. During Tanguy’s military service, part of which saw him serving with the ‘Chasseurs d’Afrique’ in Tunisia, Tanguy had met the poet Jacques Prévert. On moving to Paris at the end of his service, the pair came to live together at 54, rue du Château. This would be a fertile time for invention and Surrealism, especially after Tanguy had seen a picture by Giorgio de Chirico, Le cerveau de l’enfant of 1914, from a bus while passing a shop window. Tanguy had been so struck by the work that he leapt from the bus to look more closely at it – and henceforth turned to painting. Within a short time, this autodidact had been introduced to Breton and had become an important member of the Surrealist group. His home became a hub for the Surrealists. Indeed, it was here that the game Le cadavre exquis was created, played among people such as Marcel Duchamp and Breton as well as Prévert and Tanguy themselves. Soon, Tanguy had developed a visual language that was to serve as his foundation for the rest of his career, taking biomorphic elements and presenting them within displaced, impossible, infinite landscapes that seemed to be either in space, under the sea or in a desert. An example is his early masterpiece of 1927, Mama, Papa est blessé! now in the Museum of Modern Art, New York. In this work, an impossible narrative appears to be unfolding between the various elements depicted. This is a product of Tanguy’s automatism. Despite the jewel-like finish to his pictures, which show a phenomenal attention to detail, he almost never worked from sketches or studies, instead preferring the process of invention to occur on the canvas, leading to constant surprises. In 1939, Tanguy moved to the United States with the American artist Kay Sage, whom he would marry. He soon moved to Connecticut, partly inspired by a visit to the home of fellow artist Alexander Calder. Over time, a community of artists grew there, including André Masson and Arshile Gorky. In the States, Tanguy’s works appeared to be influenced by the American landscape, just as earlier pictures had been infused with visual reminders of, say, a trip to North Africa; this led to deeper colour and to the introduction of increasingly large elements within the compositions. Calder and Tanguy both embodied the trans-Atlantic tendencies that dominated the avant garde during the period. It is a reflection of the emblematic nature of their works that Peggy Guggenheim, on opening her Art of This Century gallery in New York in 1942, wore two different earrings, one decorated by each artist.